Unfortunately, there is no video of this one that I have found. Former U.S. president Bill Clinton listens to his wife, former Secretary of State Hillary Rodham Clinton, during a conference at the Bell Centre Wednesday night. The United States is making a mistake by moving in the opposite direction of Canada on cultural diversity, immigration and social harmony, former U.S. president Bill Clinton told a receptive audience in Montreal on Wednesday night. “Canada has done such a good job of both managing its contemporary diversity and it has a very interesting immigration system,” he said at the Bell Centre, where he and his wife, former U.S. secretary of state Hillary Rodham Clinton, made their second stop on a paid speaking tour of North America. The 13-stop tour, An Evening with the Clintons, began in Toronto on Tuesday. Canada has the capacity to embrace and influence the world in a positive way, he said. 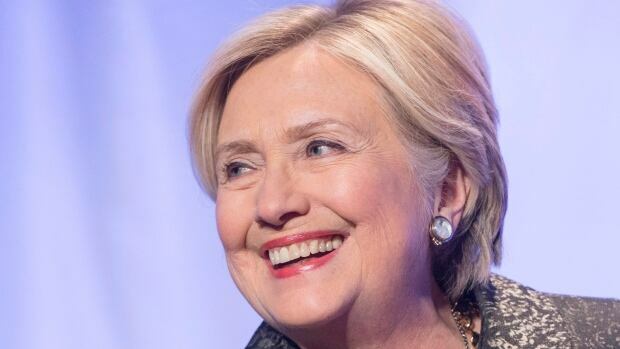 Starting Saturday, December 7, seat reservations will be available for those who would like to hear Hillary Clinton speak to the Montreal Board of Trade in March. Tuesday, March 18, 2014 from 6:30 P.M. to 7:30 P.M. These tickets are very reasonable, so if you would like to attend, I recommend you make those reservations as soon as possible! 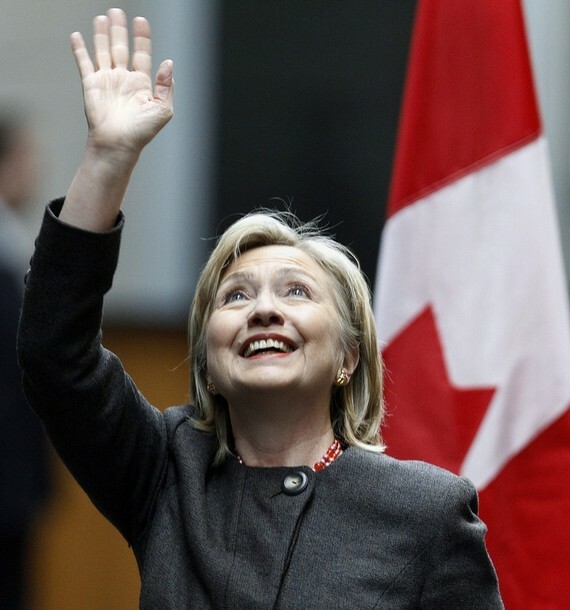 Earlier in March, Hillary will address the Vancouver Board of Trade. It will be interesting to see how the media weaves these Canadian visits into some kind of 2016 scenario. My guess is that the fabric of that fairy tale will be even more gossamer than the recent fable about the Clintons and the African American community based on a speech and a funeral (they should be ashamed!) in summer and a random photo from a White House event two weeks ago. The State Department has released two radio interviews that Secretary Clinton gave while in Montreal yesterday. Here are the transcripts. QUESTION: Secretary of State Hillary Clinton, thank you so much for your time, and talking to us about issues of Haiti. We are here at this ministerial preparatory conference. You are setting the outline, I guess, for the Haitian donors conference. Could you talk to me, first of all, about the positives that came out of this conference, and what you see down the road for Haiti? SECRETARY CLINTON: Well, April, first of all, thank you for following this story and coming to this conference in Montreal, because I think we established a good framework for how we are going to move forward. It’s only been 12 days since this horrible disaster occurred. But already we have a set of principles about how we want our work to be shaped. We have some long-term strategic objectives, and we have the beginnings of a road map for reconstruction and development. It is really heartening, and I think your listeners would find it so, that people from across the world are showing their hearts on behalf of Haiti. But it’s not enough that we show compassion. It’s not enough that we contribute to a good charity, or that we bless the use of our tax dollars to help the people of Haiti. We have to have a plan that we can execute on, that we can demonstrate results from on behalf of the people of Haiti. So, we will be having the next conference, which will try to set all of this in place, in New York in March. Because the United States has a great commitment to the people of Haiti. President Obama and I had already been working on a plan to try to assist the people of Haiti before the earthquake. So we are going to build on that, and we are going to come up with some workable, practical approaches to give the Haitians a better future. QUESTION: Now, am I correct in understanding that, from this press conference with the ministerial leaders, that it will be 10 years — you have a 10-year plan — correct? SECRETARY CLINTON: I think that the time frame that everyone is talking about is 10 years, because we look at other disasters — take, for example, the recent tsunami in Asia over Christmas of 2004 into the new year then. So that’s been five years. And a lot of good work has been done, but there is still work to be completed. But, for example, in the terrible impact of the tsunami in Indonesia, it didn’t affect the Government of Indonesia. So the Government of Indonesia and most of the country was unaffected. What happened here was so much more devastating, because it just wiped out government buildings, records, public services from schools and hospitals and police stations. The penitentiary was unfortunately damaged, and therefore, all the criminals got out. So I think most experts believe that we’re talking about, on the low end, a 5-year, on the upper end, a 10-year — of sustained commitment. And then, hopefully, we will have put the Haitian people on a strong foundation. One other example I would use is think about the terrible genocide in Rwanda. Yet now, about 15 years later, Rwanda is recovering. I mean they lost 800,000 people. It was the worst kind of terrible evil. And yet now their economy is growing, because they had a plan. And the international community stood with them while they implemented that plan. QUESTION: Well, you speak of that, and Haiti is a whole different — in a whole different boat than many of these other countries: the poorest country in the Western Hemisphere. You know, I went there and, I mean, I saw beauty in poverty, because people wanted to survive. And now they are trying to reorganize that survival, and change how they lived before. And that brings me to something that I found out this week. I talked to Mayor Ray Nagin of New Orleans, and he said his city, five years in, still has a lot of problems. And he says typically it takes a city or a community, to rebuild, 10 to 15 years. You’re talking 10. And New Orleans had buildings that at least met code. They had certain infrastructures that were in place. Haiti doesn’t. So, do you realistically think 10 years, or maybe even beyond? And, if so, it’s going to go beyond the billions and billions, and maybe into trillions, correct? SECRETARY CLINTON: I don’t think so, and here is why. I think every disaster is different. There is no doubt that what has happened to Haiti is extraordinarily damaging. If we do this right, though — the countryside was largely unaffected — if we can get economic activity going in the countryside, the farmers able to once again plant and harvest and have markets for their food, there is an opportunity here which is unique, because Haiti has been studied to death. Everybody has an opinion about what needs to be done in Haiti. The problem has been there has never been the political will matched with the resources and the pressure to follow through, as there is now. So, that’s why 10 years is a time when we will be able to assess how much has happened. Of course, there will continue to be problems and challenges beyond that. But Haiti had those before the earthquake. And part of what we have to do here is to create a different mind set among Haitians themselves. The people in the establishment in Haiti have to understand that their country and their fellow men and women can do better if they are more generous, and share the results of success. The people out in the country have to grasp education as a true vehicle for personal achievement. So, there is a lot to be done. But I am always struck by how, when Haitians leave their country, come to the U.S. or Canada or France, they are very successful. They are doctors and nurses and teachers and business leaders. And there is no reason that they cannot see that success back in Haiti, if we get the attitudes of people to match the development agenda. QUESTION: You talked about the countryside. Let’s go beyond Port-au-Prince. What is happening now to help those who are beyond the Port-au-Prince borders who are affected right now? We know that roads are still impassible. But what is this administration doing to help those? SECRETARY CLINTON: Well, actually, we are helicoptering in food, water, supplies into areas where there has been an increase in population because people are leaving Port-au-Prince. Many experts, including the prime minister, Prime Minister Bellerive, today said that this is an opportunity that should not be missed. Port-au-Prince got too big for the size of Haiti, in part, because previous governments did not invest in the countryside. And, therefore, if we can reverse some of that in-migration to Port-au-Prince, and as people are leaving Port-au-Prince to go back to their family homes, if we can provide opportunity back there, then we will have a better chance to develop Port-au-Prince in a more thoughtful way. QUESTION: Well, let’s talk about migration. You have heard the calls. Many people, to include the NAACP, CBC, they are looking for an extension into the temporary status, the protected status, for many that are here for 18 months. And they are saying it may need to happen beyond. What are your thoughts? SECRETARY CLINTON: I certainly think we have to stay open to that. I think that the immediate need to provide temporary protected status to the people who are here without documentation was necessary, and the Obama Administration did it. But we have to watch this carefully. You cannot return people until there is some sense of stability and security and opportunity. And I don’t think 18 months is a magic number. So we are going to have to evaluate this as we go forward. QUESTION: And also, Congresswoman Maxine Waters wants the United States to forgive or help the — get the help from the United States to forgive the debt to the IMF, the World Bank. Is that something that is feasible, especially now, since they need you, they need all your money, all your support? SECRETARY CLINTON: Absolutely, it’s feasible. We are looking at that. We heard presentations today from all three of those — those two organizations, plus the Inter-American Development Bank. They all recognize the need that they face in trying to work through a program for the forgiveness of debt. It’s just unrealistic to think that Haiti would ever, in the far foreseeable future, be able to repay that. QUESTION: And lastly, housing and security. What are you going to do on the ground there? And how is the U.S. really going to get involved with security over time? Because that is a major issue. And the housing, trying to house these people as they are rebuilding to a new standard, a new building code standard? SECRETARY CLINTON: Well, two things. One, as you know, we have sent thousands of our troops — soldiers and Marines — to assist in the delivery of humanitarian supplies, and also to support the UN troops on the ground in providing security. The UN troops have done a good job. The UN mission, led by a Brazilian general, has really made enormous progress in providing law and order, in working on corrections, and many of the other aspects of law enforcement. But they are overwhelmed, and the UN personnel probably will, when it’s all said and done, suffer more than 300 losses. So, this is a big burden for them to assume. But the Security Council has expanded the number of forces that they can take, in both the police training and the units of soldiers to support those that are already there. So, we are going to work closely with them, because security is paramount, and it has to be in the streets. And, as I said, we have all these people who broke out of the penitentiary. So we have, unfortunately, more than our share of dangerous criminals wandering around now that have to be disarmed and subdued and returned to a prison. But we are really committed to working on the immediate needs of shelter and housing. We talked today in our meeting about how we can come up with 200,000 tents so that people will have some shelter. We are racing against the clock, because the rainy season starts in a couple of months, and the hurricane season will also return. So we just have to do everything we can, and everyone is committed to that. QUESTION: And lastly, have you been able to talk to some of these leaders here about what many around the world are saying, this heavy-handedness by the United States in helping? They don’t want the military there, a strong military presence. It’s almost like you’re hearing the same thing with the African Union when there was a concern about bringing AFRICOM there. People don’t want the U.S. military there. What are your thoughts about that? And have you talked to these world leaders about that? SECRETARY CLINTON: Well, I have not only talked with them, I have followed the international press very closely. That’s a minority opinion. The much greater majority opinion is that the United States is using its power in a way that everyone can see helps people. We have made it clear we are not there for the long term, this is solely to assist the Haitian Government and the international community and support the UN. But, boy, are people glad to see us. And I have lots of pictures of Haitians embracing our soldiers, waving at our helicopters, expressing their thanks. So we know that some want to draw some historical parallel that is not applicable, but we are not paying any attention to that. Our goal is to help as many Haitians as possible, and our military is absolutely instrumental in doing that. QUESTION: Last note, last word from you? SECRETARY CLINTON: Just thank you for following this. This is something that, just as it’s a long-term effort on the ground, we need Americans involved for the long term. And there will be roles and opportunities for people to volunteer, to contribute, to do the kinds of things that America does better than anyone. When we come out with our heart showing in the face of these kinds of catastrophes, it’s the best example of who we are, and the values that we live by. QUESTION: Thank you so much, Secretary Clinton. You are awesome. Thanks for having me with you, and doing this interview. You keep your promises. SECRETARY CLINTON: Yes, ma’am. I try. As you know, we have known each other a long time, April. QUESTION: A very long time. Take care. QUESTION: So, you have this meeting coming up in March. What do you expect to have by then? Do you want to have that mechanism in place, some overarching thing in place? And what numbers are you looking at for commitments, then? SECRETARY CLINTON: Michele, we are trying to do this in a very careful way, sequencing steps that are necessary before we move to the next step. So, for example, the World Bank, the United Nations, the U.S., we’re doing needs assessments in Haiti. The UN and the World Bank will have their assessment, we hope, by the conference. Obviously, we’re going to time the conference to make sure we have that needs assessment. We are starting to do a lot of technical planning. There will be some technical conferences that will look at how we quickly move on some of these very big demands in health and education, security, and the like, and we will be working, in the lead-up to the conference, to try to decide on how we will organize ourselves. I am looking at all kinds of models as to what has worked in other settings, what hasn’t worked. What can we learn from even successful models? Most people think that the international response following the tsunami was quite successful, but there are some lessons to be learned from that. We are really trying to do this in a practical way. So let’s figure out what we need to do, let’s have a plan to figure out how we can get everybody on board. Let’s set up kind of an executive mechanism to actually execute with accountability, transparency, benchmarks, results. And there seems to be a great willingness on the part of everyone to actually do that and then, by the conference in New York, be able to present how we intend to proceed. QUESTION: But 10 years? I mean, do you see people ready to make that sort of commitment? SECRETARY CLINTON: I do. And I think it’s not up to any one country, or one organization. And right now we don’t know how much money will be needed. But just step back a minute and think about all the money that was going into Haiti before the earthquake. Our government gave a lot of money to Haiti. If we were to aggregate all of the charitable contributions and work from NGOs, from churches and other religious organizations, it’s a big number. My goal is that we will be better organized and focused, so that we can get more results from what we were putting in in the past, and then see what additional gaps exist. I think that if you look at, say, Rwanda, terrible human catastrophe. It didn’t affect the physical infrastructure, but when more than 800,000 people are murdered in a genocide, who would have thought that Rwanda would now be seeing economic increases in their GDP and be viewed as a real success story? Or take Indonesia after the tsunami. The hardest hit part of Indonesia was Aceh. There was an insurrection going on in Aceh. It was a devastating blow when the tsunami came in and took tens of thousands of people and destroyed for miles into the land what was there. Now, it’s really come back. It is, what, five years since the tsunami? There is still work to be done. But I think with the proper planning, and with relentless execution, we can see progress. But I’m not going to sugar-coat it. It’s going to be a very challenging time, because the Haitian Government knows it has to change. The prime minister was very clear about that in his remarks in our meeting: the people’s mindsets about education and the importance of choosing it, participating in democracy, all of those attitudes that they know they have to have a positive view towards. So, I think we are going to see a good effort. And, ultimately, it’s up to the Haitian people. But there is a great willingness by the international community to help. 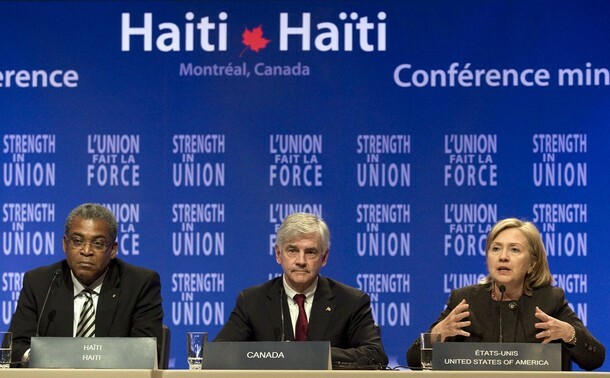 QUESTION: And you talk about partnering, rather than being a patron of Haiti, or a patronage. How do you do that, when the government was decimated in this, with this earthquake? SECRETARY CLINTON: Well, we have, I think, some positive work to build on. Because when I became Secretary of State, I talked with President Obama about the need to have a concerted effort, with respect to Haiti. He agreed, gave me the go-ahead. I put my chief of staff in charge. So, for the past year, we have been working closely with the current Haitian Government. We know them, they know us. We had plans already in place to follow through on agriculture, energy, security, and the like. So, we come into this period of crisis with some very solid thinking that has already been done. We can’t just take what we had and slap it on to where we go next. We have to be thoughtful about what might need to change or be amplified. But I think we are in a good position to work with the Haitian Government. QUESTION: But even getting the government back on its feet, I mean the U.S., I guess, is offering some space, some work space? SECRETARY CLINTON: We are. We are offering some space, we are offering communications ability, we are offering security. And we have been, ever since the earthquake. The Haitian Government is pulling itself together, coming up with its own ideas, taking the work that we had done for this past year off the shelf, looking at it. So I think we are going to be in a very positive position, working with the rest of the international community, to get prepared for the donors conference in New York. QUESTION: You turn your attention later this week to some other very long-term development needs in Afghanistan, in Yemen. What are you hoping to get out of that conference in London? I mean, more commitments? SECRETARY CLINTON: Well, these are not donor conferences. They are planning and implementation conferences. The meeting on Yemen isn’t really even a conference, it’s a meeting of countries that have been involved in Yemen, have a commitment to Yemen. They are coming together to discuss security and development. One without the other doesn’t work. We will be making clear to the representatives of the Government of Yemen what we expect and how we intend to work with them. With Afghanistan, it certainly is farther advanced. We already have a lot of commitments for not just military assets, but a lot of development work. President Karzai will be there. He is coming with some very good plans that he has been working on with his new government. So I think you will see what they say at conferences are deliverables, in other words, really tangible commitments coming out of the conference by many different parties who will attend. QUESTION: One of the things he is talking about is this reconciliation with some Taliban, trying to divide the insurgency, as David Miliband put it recently. What does the U.S. think about that? SECRETARY CLINTON: Well, we believe that ultimately, in any conflict, there has to be a political resolution. And we support the Government of Afghanistan as it is taking steps. We are obviously concerned about specific actions. We want to have a thorough understanding of everything that President Karzai is planning. We want to know the conditions. There are two end states that are being discussed. One is called reintegration, which has done a lot on the battlefield. Our military did this in Iraq, they will do it again in Afghanistan with the same kind of approach, because a lot of the people who are foot soldiers for the Taliban are there because they get paid, or there because they were essentially volunteered up by their village elders. They have no other real alternatives, so we want to help the Government of Afghanistan provide that alternative. Then there is reconciliation, which is the longer term political agenda, which would really look at seeing whether or not any level of leadership of the Taliban would be willing to re-enter the political system inside Afghanistan, eschewing violence, turning away from al-Qaida, basically determining to compete peacefully inside of the society. It’s way too soon to tell whether we can expect any positive developments, but it is an important part of our overall strategy. QUESTION: And something you will be hearing about from Karzai. SECRETARY CLINTON: Yes, I will. I will. SECRETARY CLINTON: Good to talk to you, as always. 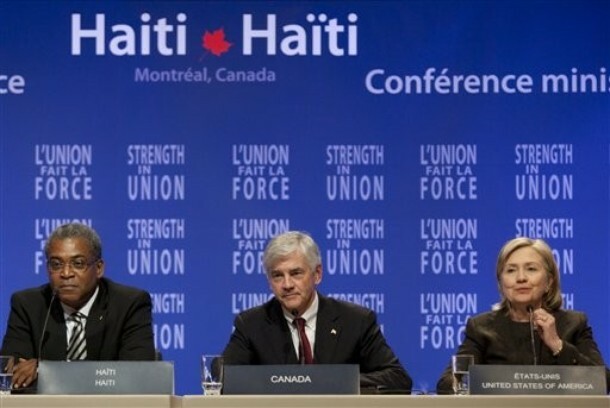 As announced last week, Hillary Clinton flew to Montreal today to attend the Ministerial Preparatory Conference on Haiti, hosted by her Canadian counterpart, Foreign Minister Lawrence Cannon. The purpose of the conference was to initiate a plan, a road map, for the reconstruction of Haiti, the poorest country in the Americas , devastated by the cataclysm of the 7.0 earthquake of January 12. 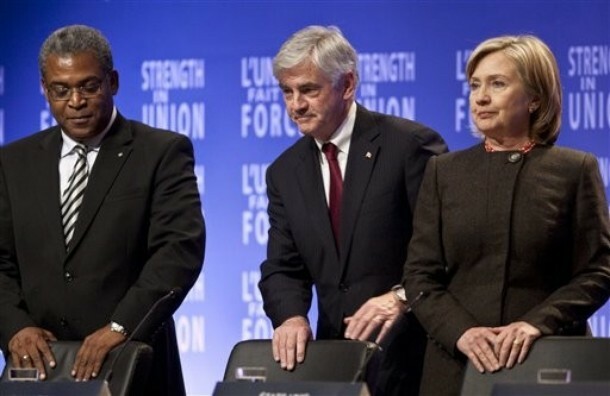 No results of this conference have been made public as yet, however there are plenty of pictures of this large and important event in which the United States, and Hillary Clinton, in particular, played a special role. She was greeted by Canadian Foreign Minister Lawrence Cannon, who was supposed to have met with her last week to plan for the conference, but his plane was grounded for mechanical reasons, and they conferred by phone instead. There was enormous international participation. They began with a moment of silence for the victims of the earthquake. 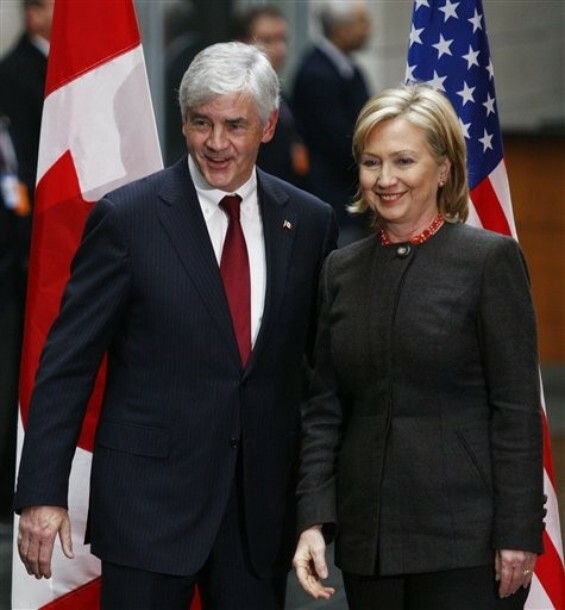 I like this picture because it is Prime Minister Bellerive, Prime Minister Harper, and Hillary. Haitian Prime Minister Jean-Max Bellerive spoke to the assembly about the situation in Haiti. The Secretary clearly has a warm relationship with Canada’s Prime Minister Stephen Harper. She spoke to the press. These pictures are from the closing statements. We see Hillary speaking as well as French Foreign Minister Bernard Kouchner. This picture! For so MANY reasons! Hillary with Mexican Secretary of Foreign Affairs Patricia Espinosa Cantellano. Strong Imter-American friendship. Hillary has fans everywhere. Clearly she has won some Canadian hearts. They have superb taste! Of course today is only Monday and the week is young. The turbo-Secretary continues a foreign travel agenda this week as announced by P.J. Crowley below. 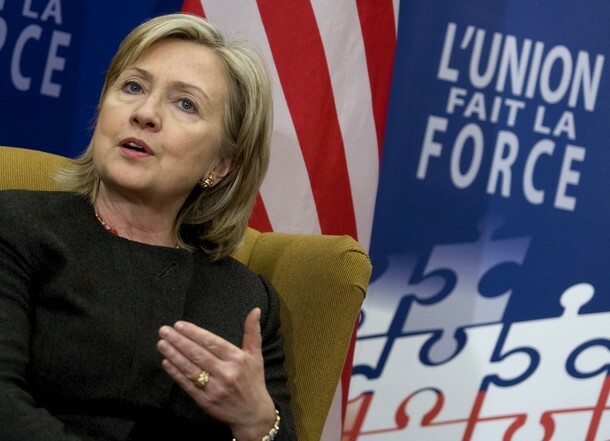 Secretary of State Clinton will travel to London and Paris from January 26 to 29, 2010. In London, Secretary Clinton will attend a ministerial meeting on Yemen on January 27 and the International Conference on Afghanistan on January 28. The goal of the Yemen meeting is to consolidate international support for Yemen, coordinate assistance efforts, and reach agreement on assisting Yemen in its political and economic reform efforts. The objective of the London Conference on Afghanistan is to demonstrate the international community’s support for Afghanistan’s future and the agenda outlined by President Karzai in his November 19 inauguration speech. The meetings will focus on the implementation of our strategy in support of Afghanistan’s security, governance and development, and improved international civilian coordination. The Secretary will end her trip in Paris, where she will give a speech on European security, in addition to meeting with President Sarkozy and Foreign Minister Kouchner to discuss the international Haiti relief effort, developments in Iran, Yemen, Afghanistan and Pakistan, and an array of other issues of mutual concern. Hillary Clinton in Paris? It must be Spring! On the serious side, Haiti does require surgical intervention to its infrastructure AND superstructure ASAP. It is good that today’s meeting took place quickly. Much needs to be done before the hurricane season/rainy season hits. On the news today, I saw that many people are migrating to Gonaives. That is a city that was badly hit by the hurricanes and tropical storms two years ago. When storms come to Haiti, the water rushes down the deforested mountains in torrents and washes everything, people, livestock, cars, and other machines out to sea. Tents will not be enough. SECRETARY CLINTON: I think there will be a couple of preliminary announcements just because we’re trying to get organized for what will be a big donor conference that will come within the next 30 to 60 days. And there’s a tremendous desire to help, but we’ve got to create the mechanisms so that it can be done effectively, and we’ve got to get the Haitian Government’s capacity to lead put together. So there’s a lot we’re working on today, and I’m optimistic that we’ll put together a good plan. It’s always hard to move from planning to implementation, but that’s what I’m determined we’re going to do. And the UN has been working very hard to recover, first of all, from their losses. They’ll probably end up losing altogether more than 300 people, and that’s – just think about any organization that you’re part of, when you have that kind of a tremendous tragedy. But they’ve worked really hard on the ground and our people have been working with them and Cheryl Mills, who is with us, is working more closely. Because the advantage that I hope we’re bringing into this is that for the past year, we’ve been working with the Haitian Government on a plan, and we have a well thought-out plan that they had been fully involved in helping to construct. Obviously, it has to be revised in light of the circumstances we’re facing, but we had already done so much of the work, built the relationships with the president, the prime minister, other members of the government, as well as members of the legislature and the private business sector. I mean, I don’t know if any of you had any reason to notice this, but the Monday night before the earthquake, there was an extraordinary, long report on Jim Lehrer on PBS that talked about everything we’re doing. And it was realistic in saying, “Look, there’s a lot that has to be done.” But it was hopeful in saying, “But it looks like people are really focused on doing what is both necessary and achievable,” and talked about my husband’s work with the private sector. And he had just had a conference with 500 businesspeople. They were signing contracts, they were making investments. Twenty four hours later, we get this terrible calamity. So we have a plan. It was a legitimate plan, it was done in conjunction with other international donors, with the United Nations. And I don’t want to start from scratch, but we have to recognize the changed challenges we are now confronting. So I think we’ll see some positive come out of it. QUESTION: How many (inaudible) donors conference (inaudible)? SECRETARY CLINTON: I’m sorry, what, April? QUESTION: How many (inaudible) donors conference? SECRETARY CLINTON: Don’t know yet, don’t know yet. We’re going to be putting it together and trying to get the right level of commitment and accountability so that people take responsibility, but it’s part of an overall mechanism, that we can actually judge what’s being done on the ground. It’s a challenge. QUESTION: Do you expect (inaudible) to write off some of their debt? SECRETARY CLINTON: People are looking at that. I think that’s a very important piece of the puzzle. QUESTION: What’s the long-range plan for Haiti in connection with the United States? SECRETARY CLINTON: Well, I think we’ve got an ongoing responsibility, which is why when I talked to President Obama back in February about taking on a leadership role and working on behalf of Haiti, he was very supportive. And we’ve been doing it for a year, so this is not new to us that all of a sudden, we wake up and there’s this terrible catastrophe in our neighborhood. But other countries also have relations with Haiti. Canada is the second-biggest donor. France obviously has a historic relationship. I met with the new high representative of the European Union; they want to be involved. So we’ve got a lot of good players with commitments at the table; I just want to be sure we get it worked out right. STAFF: Guys, we got to make up time. QUESTION: What’s the U.S. contribution? QUESTION: The U.S. contribution was announced at a hundred million? SECRETARY CLINTON: Oh, that was just for the emergency. SECRETARY CLINTON: There will be more to come. Yeah, there will be more to come. 8:15 a.m. Secretary Clinton meets with His Excellency Franco Frattini, Foreign Minister of Italy, at the Department of State.